The Bricks in Motion official summer contest. Movie Magic is still going on! The contest runs from June 1st to September 3rd. Our generous sponsors Dragonframe and Brickstuff have returned to offer prizes this year, and we have a lovely batch of goodies to be won including Dragonframe software, a Brickstuff lighting kit, a LEGO Architecture set, and more! For complete details, check out the announcement post on the forums. We hope this theme will really let people stretch their creative wings, and we're looking forward to seeing what you all come up with. Happy filming! For the full rules and information about how to enter BRAWL 2018, check out the Announement Post on the Forums! BRAWL 2018 will take place from July 8 to July 15! The Brickfilm Rapidly All Week Long (BRAWL) Contest 2018 has been officially announced by new host Chris W. The contest is set to take place from July 8 to July 15, 2018. Chris has created an announcement video for the contest that explains how it works, which can be viewed here. This is a special year for BRAWL, as it is the 10th anniversary of the contest, and BRAWL 2018 will also be the 10th BRAWL. To read the full contest announcement, click here. Original post by Brick101 on the forums. Interested in submitting a film? Check out out the full details, rules, and prizes, and discuss the Brickworld Film Festival on the forums! POLL: When should BRAWL 2018 take place? Please click the link below and vote in the poll and leave any additional comments or questions. The poll will run for two weeks and the official announcement post will be posted in the next month to month-and-a-half. To discuss, join the conversation in the forum! For the full top 10, visit the results thread! Click here for the playlist of entries. Bricks in Motion's Twenty-four Hour Animation Contest XV has started! The theme is "An Unlikely Alliance". The color mod element is a a green piece connected to or directly touching a white piece. The letter mod element is the letter T.
For the full contest details, visit the forum thread! The Brickfilm Feature: Christmas Edition! It has been a while since I last wrote a feature, but I just couldn't let Christmas go by without one. Before we get into the older stuff, I must start out by saying that if you have managed to not see the community project A Brickfilm Christmas by now, then that would be the best thing to go watch. I'll give full disclosure that I tend to gravitate towards the comedy films, so there's nothing overtly religious on this list. Hopefully if there are replies with Christmas brickfilm recommendations, people will mention the more traditional Christmas brickfilms that stand out to them. Though not massively well known, The Christmas Tree is a Christmas classic among brickfilmers who were around for its release. The premise is simple: A man has forgotten to buy a Christmas tree and heads out in a rush to get one. What makes this film so fun is the consistently entertaining animation and the amusing voice acting by Loïc F-B, who always provides a great comedic performance. To read more and see the rest of the films featured, visit the forum thread! 'Bricks in Motion' Now Available on Amazon Prime and iTunes! We are proud to announce that the Bricks in Motion documentary is now available on Amazon Prime and on iTunes! The film is free to watch for Amazon Prime subscribers, and may be rented or purchased otherwise. I'm excited the documentary now has a chance to be seen by a larger audience, thanks to a partnership with executive producers Andre Gaines and Valerie Edwards of our distributor for the film, Cinemation. And many thanks to our crowdfunding supporters for this project, without whom none of this would have been possible. 'A Brickfilm Christmas' - A half-hour community project Christmas special from Tof Animation and Bricks in Motion! A new community project brickfilm has been released! A Brickfilm Christmas takes the style of a TV Christmas special, and follows a group of brickfilmers grounded in an airport telling the stories of their favourite Christmas memories, complete with animated commercial breaks. It was coordinated by thistof on Bricks in Motion and features 20 different animators providing contributions, all of which were created for the project. This is the first community project to be completed by the community of Bricks in Motion since 2012. I personally had been holding out hope to eventually see a more narrative-based community project, and a clever framing device has allowed this film to strike a balance between the narrative-driven and film compilation community project styles. It is also the longest original community project brickfilm to be released. This is truly a special moment in brickfilming, and I congratulate everyone who was involved in making this project a success! Head to the release thread to watch the film and reply! THAC XV is coming in January 2018! 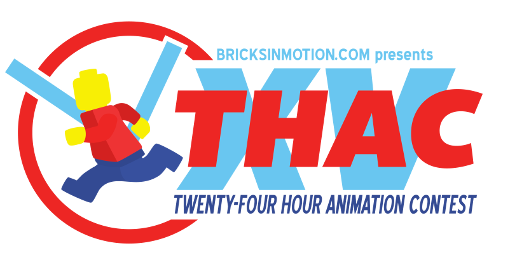 Nathan Wells has announced Bricks in Motion's Twenty-four Hour Animation Contest XV, which will begin on January 6, 2018. For the full Top Ten results, visit the forum thread! That's right; another official LEGO contest announcement already! There is a new brickfilm contest on Rebrick called "A LEGO House Dream", for films depicting what you would expect to see and do in the new LEGO House in Billund, Denmark. Three winners will receive the LEGO set of the LEGO House signed by the designer, and the one Grand Prize winner will also receive a trip for two to Billund, Denmark with tickets to visit the LEGO House. Entries to the contest must be between 15 and 30 seconds, and the deadline is November 3. This is a shorter Rebrick contest than usual so the competition might not be so fierce. If you can whip up 30 seconds in a month, I think it sounds worth giving your best shot. Don't forget that the official LEGO Thor: Ragnarok Contest was also announced a few days ago on Brick à Brack! I would like to bring attention to a contest that is being run by our French friends at Brick à Brack on behalf of The LEGO Group. LEGO requested that they host the Thor: Ragnarok Contest to tie in with the upcoming Marvel film and related LEGO sets. The contest is for short brickfilms starring Thor, and the deadline is October 29. The contest is open to worldwide entries and the announcement and rules are in English, so make sure to check it out! With that in mind, I decided this edition of The Brickfilm Feature should have a French theme. While France has given us some of the greatest brickfilms ever made, there is another area that has piqued my interest and has been on the cards for a feature. I have noticed a bit of a trend among French (and French Canadian) brickfilmers to create short and quirky films based on a single novel concept or experimental animation technique. Due to these films usually being rather strange, I affectionately refer to them as "French insanity films". Fittingly, this type of film is often made for Brick à Brack's popular animation challenge, which seems to attract more filmic entries than the animation challenge on BiM. I love these films as there is a great sense of fun to be found in them. They also seem like a good way to release films more frequently, rather than just leave the ideas as tests. I have chosen 10 films by 5 directors, which may look like a lot but actually comes out to about 9 minutes total viewing time. There is no language barrier. This is the French Canadian portion of the feature. Loïc F-B has been around on both BàB and BiM for a long time, and though he hasn't released a film in a couple of years, he remains active as an admin of Brick à Brack and is participating in hosting the Thor: Ragnarok Contest. One problem with this feature is that it's often the case with with these types of films that the less is said, the better. I will say that EARWAX is well voiced by Loïc and Squid, Hand'Shoes features an excellent interpretation of the animation challenge theme "Walking on Hands", and Choo choo!... Well, you just need to watch Choo choo!. To see the rest of the films featured, visit the forum thread! 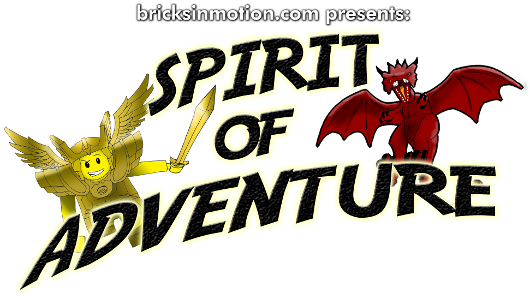 First, I would like to mention that the Spirit of Adventure Contest has ended, receiving 24 entries. Thank you to all who entered! Check out the playlist of entries here. Perhaps some of the other picks are too obvious for some, so now here is a film that I believe needs to be rescued from total obscurity. Only one scene of this film takes place in a classroom, but it still counts. His Mind's Account is an abstract brickfilm that incorporates multiple types of animation. I won't try to explain it, as all I can really say for certain is that it definitely held my attention for more than one viewing. It features some nice moody lighting, and a stand-out digital effect that is blended in well (...if that makes sense). I find it impressive that the director made this at age 14, as it is more thought provoking than what most would think to make at that age. For today, I thought it would be fitting to create a feature to tie in with the solar eclipse. However, there really aren't many brickfilms that deal with eclipses or even blindness, so instead I have mostly selected films about the sun and the moon in some way. I'm sure Americans are sick of hearing this song by now, but this is really the only eclipse-related brickfilm that came to mind. Luckily, it is a good one, as it comes from one of the all-time great brickfilmers, golego. This is a music video for a recording of the song by a Welsh choir, and was commissioned by Decca Music Group to promote the album it is taken from. Unfortunately, golego's own upload of the film was eventually struck down due to copyright detection, despite being authorised. This film makes great use of camera movement and especially lighting, with one of the standout elements being the under-lit stage. By being made with LEGO, it uses the lines about falling apart to comedic effect. Impressively, this film was produced in only two weeks. Dare I bring up the subject? There seems to exist a common popularity, amongst Brickfilmers, of using characters, stories, and media that originate with and belong to someone else, most commonly corporate entities. I’m referring to Intellectual Property Films (aka IP Films). The convenience of utilizing recognizable mini-figures from pop culture with preexisting back stories argues the point we can make IP brickfilms. Companies manufactured them; we buy them at the store, why can’t we use them in brickfilms? I counter that argument with The LEGO® Company’s own mission statement: "Our ultimate purpose is to inspire and develop children to think creatively, reason systematically and release their potential to shape their own future -- experiencing the endless human possibility." Does recycling characters and stories from pop culture, demonstrate creative thinking? It can, but all-too-often we see brickfilms resulting from IP that don’t. I realize in bringing this up, I open a criticism of brickfilming itself. The bricks aren’t something we made ourselves. Indeed, a corporation invented them, developed them, manufactured them, patented and trademarked them and sold them TO US. The very notion of our films’ originality, hinges on the reality that these companies encourage creativity with their products. These interlocking bricks are so pervasive and universal they are more than toys. They are a medium. While we may own some bricks, we do not own Darth Vader. He belongs to Disney (apropos if you ask me). Some use IP source materials as a crutch to generate stories that will get attention due to ease of recognition, but others use it as a medium to surpass re-production and mimicry. Despite not owning the Marvel Universe you can use the IP source material as a medium to explore ideas! I have this addiction to collecting things, but my obsessive nature insists that my collections be complete. That’s a difficult thing to accomplish, unless… your collection is VERY specific, and VERY obscure. Right now I’m collecting LEGO pirate hats (one of each type that has been molded and printed) and I believe I will complete my collection without too much difficulty. But this post isn’t about pieces, it’s about films. In recent years, I have noticed a shift in focus away from brickfilm effects being accomplished through CG and bluescreening, and greater thought given to how to accomplish as much as possible in-camera. I think this trend was accelerated by The LEGO Movie's focus on keeping everything theoretically possible in stop-motion, to admirable results (though of course the emphasis is on "theoretically", for many shots). Unfortunately, it appears that the LEGO Movie sequels are becoming less "purist" in this regard, but I am glad to see the influence continue to grow in brickfilming. Computer effects can often be used to great effect, but I enjoy seeing the creativity that can go into the in-camera solutions, so for this feature I have chosen a handful of brickfilms that make use of interesting in-camera techniques, whether in visual effects, set design, lighting, or otherwise. 1. Technic Challengers is a recent series of LEGO commercials animated by Dylan Woodley, AKA NXTManiac. What really stands out to me in this series effects-wise are the brick-built effects used to create clouds of dust and snow. These have an exaggerated, stylised look and make great use of many types of sloped LEGO pieces. I could imagine this type of technique being influential to somebody with a LEGO collection more sorted than my own. There is also particularly amazing camera movement in A City Crook is no Match for Technic Vehicles!, and of course sublime animation throughout the series. Two more of these films are as of yet unreleased, and I hope LEGO still plan on uploading them. In 2015, Nathan Wells ran the Brickfilm of the Week feature, with myself and Sméagol joining in towards the second half. For a while now, I have been thinking about launching a successor to that feature, and when nswihart began talking about how he wanted to see a feature and would also be willing to write for one, it seemed like now would be a good time to start one up again. Welcome to the first installment of The Brickfilm Feature! While Brickfilm of the Week featured one classic brickfilm each week, I plan for the format of this new feature to be less defined. My main focus for now will be on featuring a number of brickfilms under a common theme, no matter their age or fame. It may also include Brickfilm of the Week-style single film features if the film is substantial, or other formats entirely. There will also be multiple writers, and hopefully some once-off guest writers. If you enjoy seeing content like this, I would encourage you to try to leave responses to the threads, as visible response helps motivation to continue writing articles. For this inaugural feature, I will be highlighting “Unusual adventure brickfilms”. 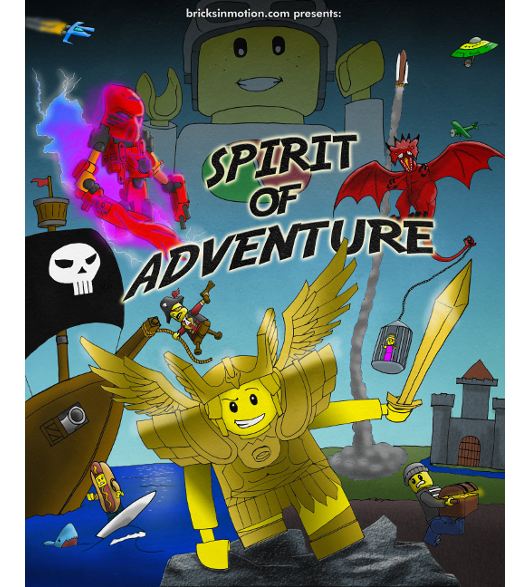 With there still being more than enough time to begin an entry to the Spirit of Adventure Contest, I thought I would encourage out-of-the-box thinking in regards to the theme in the hopes of inspiring those who don't have enough time or LEGO to craft an adventure on a larger scale. A tightly made short with a strong concept can have just as much of a fighting chance as a mini-epic (as I myself have found out in previous contests). To see the full post including the films featured, visit the forum thread! BRAWL 2017 has ended - watch the entries! The Brickfilm Rapidly All Week Long Contest 2017 has come to an end! The contest has received 24 qualifying entries, which is up from last year. The standard of quality is quite impressive, and the experimental theme has led to great variety in the filmmaking approaches taken. Check out the entries in the YouTube playlist, then head over to the Releases forum to leave responses! Don't forget, there is still more than two months left to enter the Spirit of Adventure Contest, for a chance to win Dragonframe and other great prizes! The Brickfilm Rapidly All Week Long Contest 2017 has started! The theme is Experimental and the mod elements are a blue brick connected to a white brick and the letter R. The deadline is July 2 at 0:00 BST (British Standard Time). For full details, see the contest start thread! The contest will run from June 5th to September 10th. 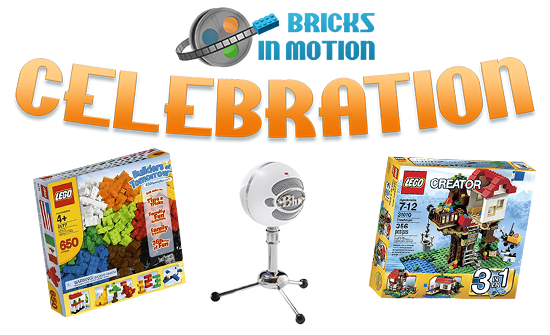 Prizes for this year’s competition are provided in part by this year’s sponsors: Dragonframe, Brickstuff and The LEGO Animation Book! In addition to the prize pool for the top three, this contest also includes a prize for Promising Director. Want to learn more? Check out the forum post for complete details on this contest! BRAWL 2017 is coming soon! Bricks in Motion is happy to announce the 2017 Brickfilm Rapidly All Week Long (BRAWL) contest! Brickfilmers will have one week to create an entry from June 25 until July 2, starting and ending at 12:00 am (00:00) BST (British Standard Time). The contest is being hosted by longtime host FunSucker and prizes are again being generously provided by BrickWarriors. Read the full announcement and rules in the announcement thread! The BRAWL contest has been hosted on the Bricks in Motion forums since 2008, the year the site began, but this is the first time that the contest is being held in official association with Bricks in Motion. Read more about the history of BRAWL on the Brickfilms Wiki page. BrickVideo Studio is running its second brickfilm contest, "Spring Blossoms". This follows their successful "Fooled" contest, and it is again sponsored by Minifigures.com, with an upgrade to the prizes. Entries to the contest must include a flower or plant, and the deadline is June 24. BrickVideo Studio was founded by Daniel Utecht (known as Plastic Planet Productions on YouTube) and Don Potratz. It streams brickfilms to TV using Roku, and the first place prize for the Spring Blossoms contest includes a Roku player. LEGO has announced a new Rebrick brickfilming competition, "Ninja for a Day", for 15 - 30 second films showing how a resident of Ninjago city spends their day. 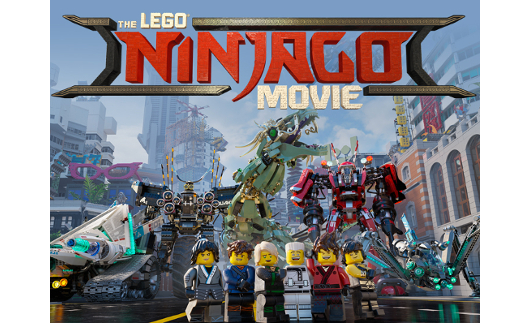 This is the second Ninjago-themed Rebrick contest, and this time six winners will have the chance to have their animation featured in The LEGO Ninjago Movie, in addition to receiving a huge haul of prizes including the full LEGO Ninjago Movie set range and a mystery exclusive Ninjago set valued at $300. This is the first time that all six winners will receive the grand prize, rather than some of them winning runner-up prizes as in previous Rebrick contests. The deadline is May 10, and the higher chance to win big really does make this contest seem worth entering. Visit the Rebrick thread in the BiM forums to discuss, or read more about the Rebrick competions on the wiki! We have a major announcement to make about the future of this website. Read the full information here! Nope, this isn’t testing out how Raggedy Ann and Andy move. This is real. This is legit. Camera movement for stop motion. Take a look. Do you have the pieces to build this camera rig yourself? Does this give you ideas for making your own camera movement rig? Do you see a way to improve upon the design for moving the camera further? Join the conversation in this week’s highlighted topic. Need some voice actors? Trying to find that voice that fits a certain villain/hero? All your characters sound like the same person, because they’re all voiced by YOU? Come on over to The Brickfilm Casting Agency! We’ve got all types, some are quicker at response than others, and there’s a few restrictions for some, but there’s enough variety to fill your whole cast. Please remember to be respectful of other’s time, and they will do their best to help you out, they are volunteering after all. Read through the list of available voice actors and see who might be able to help you out. Get your cast assembled today! Results for the latest 24-Hour Animation Contest are out! Congratulations to the team behind (Never) Meant to Be for their win. For the full top ten list, visit the announcement thread. 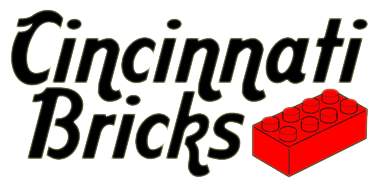 Thank you to our contest sponsors, Brickstuff and David Pagano and David Pickett for providing the prizes! Bricks in Motion, a feature length documentary about the world of LEGO animators, is now available for purchase on Vimeo On Demand. Had a chance to see the film? Discuss the film with the community in the official discussion thread! If you do, and you’re looking at investing in a DSLR camera and/or lenses for a DSLR, then you might want to visit this topic. Our own SlothPaladin has assembled this topic as a resource for viewing and understanding the results of a handful of commonly used lenses for Nikon cameras with respect to stop-motion animation. As a DSLR (and lenses for DSLRs) are expensive, it is wise to research before making a purchase, and most information you can find online regarding these cameras is related to general photography, rather than stop-motion photography. This topic/guide is a bit more specific to the “focus” of stop-motion animation. Learn about Nikkor Lenses here. PS: No Highlighted Topic next week in lieu of a forthcoming special announcement! BricksinMotion.com has grown. This expansion continues, and sometimes the things we enjoyed so much about our dear communal endeavor to fill the world with brickfilms can fade into distant memory. Kicking things off we'll start with the once reborn Animation Challenge topic in the forums under "General Film Discussion". This topic presents a fun and simple challenge to animate some unique activity. Imagination and creativity are always welcome! Use it as an opportunity to expand your skill set as an animator. Challenge yourself and others, each winner passes the torch to the next challenger who selects the next subject and deadline. Simple, short, and fun. Explore the topic’s past winners to get a feel of how to compete, read the directions to know how to compete, and challenge yourself. This animation is a favorite example of a winning submission. Check out the Animation Challenge topic here. PS: Can you find the chicken in the topic? It's that time of year again! 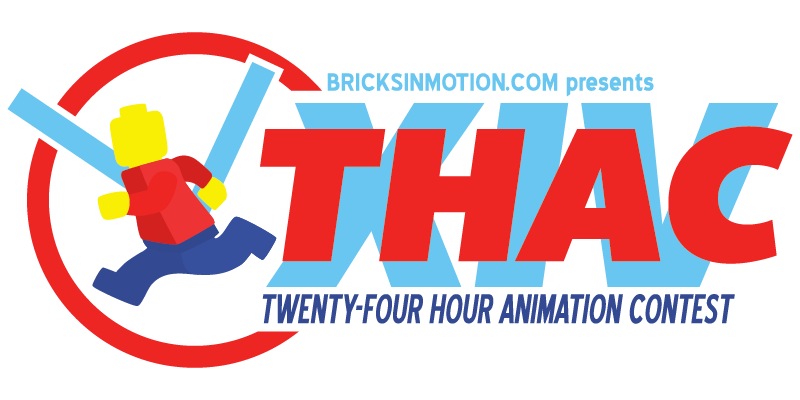 The next Twenty-four Hour Animation contest, sponsored by Brickstuff and David Pickett & David Pagano, will be held January 7-8 of 2017. For full contest details, visit the discussion thread. Longtime pillars of the brickfilming community David Pagano and David Pickett, in cooperation with No Starch Press, have published a new book about how to make LEGO animations. Whether you are just getting started or have been involved in the hobby for quite some time, this is a helpful guidebook that covers the process of making a film from start to finish. I was particularly impressed by the artful layouts and heavy use of visual aids and illustration throughout; this book has been years in the making, and the talent and hard work put into it is evident in every page. If you're looking for a solid introduction to any aspect of how to make a LEGO animation (whether it's a very basic beginner film or something more advanced), I think this book will prove to be an invaluable resource and an enjoyable read. The book is available through No Starch Press (includes a free eBook copy!) or on Amazon. Questions? Comments? Discuss the book in the forums! Without the generosity of companies like Dragonframe and Brickstuff, having great prizes for these contests wouldn't be possible. Both of them make excellent products that have a lot of use for brickfilming, and I encourage you to give them a look. For the full Top Ten results, visit the forum! 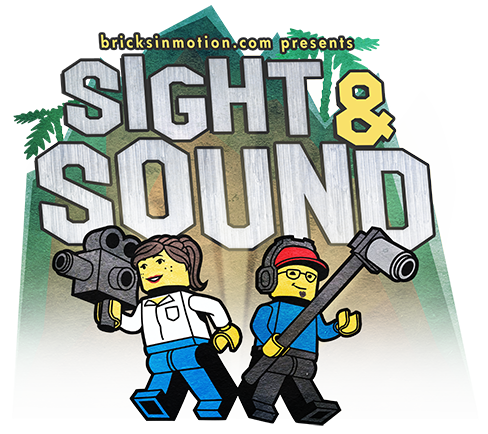 The theme of BricksInMotion.com’s 2016 contest is Sight & Sound. The contest will run from June 1st to September 1st. Prizes for this year’s competition are provided in part by this year’s sponsors: Dragonframe and Brickstuff! Eager to learn more? Check out the forum post for complete details on this contest! After deliberation and public polling, the winners of the Bricks in Motion Awards for films released in 2015 have been announced. Visit the announcement thread to see the results and discuss! Announcing the 2015 Bricks in Motion Awards Nominees! Bricks in Motion is proud to present the nominees for the 2015 Bricks in Motion Awards! This is an annual awards event that recognizes and celebrates excellence in brickfilming in a wide variety of categories and disciplines. Our panel of judges have sorted through a year’s worth of films and voted on them in 11 individual categories until a final list of 5 nominees was agreed upon for each category. Very soon, we will be sending out the final ballots, and once those votes are tallied and winners chosen, they will be announced via a live awards show in the Bricks in Motion IRC Chat (more details on that later). You can check out all of the nominees here! After a busy 24 hours, we've got more than 60 entries to the 13th Twenty-four Hour Animation Contest! While we wait for the judges to complete the selection process for contest winners, there are plenty of entries to keep you entertained in the meantime! Check out the entries via the releases forum, or visit this official playlist for the entries uploaded to YouTube. Thank you to Brickstuff for sponsoring the competition! The final Brickfilm of the Week is (fittingly) The End by Graeme Allen. The End is a 2006 brickfilm by Graeme Allen. It follows the story of two guys who are waiting around after the end of the world. Watch The End on YouTube, then head over to the discussion thread to discuss with your fellow brickfilmers! Once you've had a look, head on to the discussion forum to share your thoughts! This week’s Brickfilm of the Week is Faithless by Matthew Gray. Faithless is a 2006 brickfilm by Matthew Gray. It follows the story of a man in Limbo who is attempting to piece together the mystery of his own death. Matthew Gray was a member of Brickfilms.com. He only made three brickfilms, the most well-known by far being Faithless. Watch Faithless on the Brickfilm Archive, then head over to the discussion thread to discuss with your fellow brickfilmers! Twenty-four Hour Animation Contest XIII - Coming January 2016! 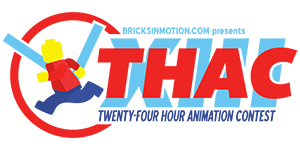 THAC is a brickfilming contest that lasts for exactly 24 hours. All brainstorming, writing, recording, animating, editing and submitting must be done within the time limit. It's a challenge, it's frantic, and it's a lot of fun! Learn more about the contest here! Results from the TCOTY Lives contest have been announced. Congratulations to Rioforce and the rest of the entrants. Watch The White Ninja on YouTube, then head over to the discussion thread to discuss with your fellow brickfilmers! This week’s Brickfilm of the Week is The Pilgrim's Son by Jason Boyle. The Pilgrim's Son is a comedy adventure 2010 brickfilm by Jason Boyle about the pilgrim Derwin's son being hunted for to be used as a sacrifice to fulfill a prophecy. It is the last of five Pilgrim films, but was made to be understandable without having seen the preceding films. Each Pilgrim film was usually released around a Thanksgiving, with the one exception being The Pilgrim's Christmas. At 25 minutes, The Pilgrim's Son is Boyle's longest brickfilm, and was considered by him to be his best. Watch The Pilgrim's Son on the Brickfilm Archive, then head over to the discussion thread to discuss with your fellow brickfilmers! This week’s Brickfilm of the Week is Rübermachen by Felix Czepluch, Cornelius Koch and Theodor Becker. Rübermachen is a 2008 drama brickfilm by Felix Czepluch, Cornelius Koch and Theodor Becker that follows two refugees attempting to cross the inner German border. It was created for the 2008 edition of Steinerei, the annual German brickfilm festival and competition. It combines stop-motion segments with brick mosaic animation created with Photoshop, and features sets made primarily from model railway decorations, to achieve a more serious tone. Watch Rübermachen on YouTube, then head over to the discussion thread to discuss with your fellow brickfilmers! This week’s Brickfilm of the Week is 1xY by Errol Elumir. 1xY is a 2003 action brickfilm by Errol Elumir. It is Errol's first brickfilm and was created for and won a competition held by his workplace, The Children's Technology Workshop. 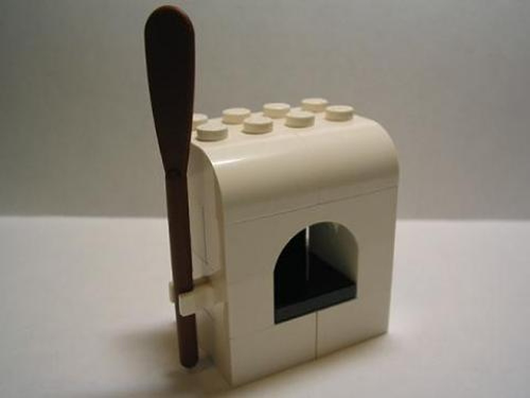 It is known for its use of LEGO plates as characters, rather than minifigures (a necessity due to Errol's lack of LEGO at the time), and its minimalistic approach went on to help influence the 2004 10 Brick Contest. Watch 1xY on YouTube, then head over to the discussion thread to discuss with your fellow brickfilmers! This week’s Brickfilm of the Week is Major Malfunction by Kyle Cullum. Major Malfunction is a 2012 slapstick action brickfilm by Kyle "MisterMulluc" Cullum. It follows a robot on wheels that chases and fires at some men trying to have a picnic. It is the last brickfilm to be released by Cullum. Watch Major Malfunction on YouTube, then head over to the discussion thread to discuss with your fellow brickfilmers! Our Brickfilm of the Week Horror Special concludes! This week’s Brickfilm of the Week is Good Company: Redux by Nick Maniatis. Good Company is a 2002 horror brickfilm by Nick Maniatis about. It was an entry to the ShootinBricks.com Horror Animation Contest and won in four of the judging categories; the most wins of any entrant. In 2003, Maniatis released a director's cut known as Good Company: Redux with three minutes of additional footage. The Redux version is considered the definitive version of Good Company. Watch Good Company: Redux on YouTube then head over to the discussion thread to discuss with your fellow brickfilmers! Our Brickfilm of the Week Horror Special continues! This week’s Brickfilm of the Week is Dance of Death by Steffen Troeger. Dance of Death (German: Totentanz) is a 2004 horror brickfilm directed by Steffen Troeger and animated by Troeger and Andreas Mooslechner. It is based on the 1813 poem of the same name by Johann Wolfgang von Goethe. It placed first in the NWBrickCon 2004 Mystery Contest and won the audience choice for Best Film at Steinerei 2005. Watch Dance of Death on YouTube, then head over to the discussion thread to discuss with your fellow brickfilmers! Our Brickfilm of the Week Horror Special continues! This week’s Brickfilm of the Week is Descension by Ben Brenninkmeyer. Descension is a 2002 horror brickfilm by Ben Brenninkmeyer. It is about two monks who investigate a horror down a staircase. It was an entry to the Horror Animation Contest and was nominated for Scariest Scene, Best Sound Effects and Best Set Design. Watch Descension on the Brickfilms Archive, then head over to the discussion thread to discuss with your fellow brickfilmers! Our Brickfilm of the Week Horror Special continues! This week’s Brickfilm of the Week is Frankenstein by Robinson Wood. Frankenstein is a 2005 horror brickfilm by Robinson Wood. It is an adaptation of the Mary Shelley novel of the same name and was an entry to the Heroes and Villains Contest hosted by Brickfilms.com, in which it placed first. It also was nominated for six 2005 Bricking Achievement in Motion Picture Arts awards, winning two. Watch Frankenstein on YouTube, then head over to the discussion thread to discuss with your fellow brickfilmers! To kick off the month of October appropriately, this week’s Brickfilm of the Week is Chase of Horror by Martin Bretzer and Tobias Becker. Chase of Horror is a 2006 black comedy/horror brickfilm by German brickfilmers Martin Bretzer and Tobias Becker ("mtproductions"). It follows a man driving recklessly at night who is chased by the police for running over two bank robbers and stealing their money. Watch Chase of Horror on YouTube, then head over to the discussion thread to discuss with your fellow brickfilmers! Congratulations to our top four winners, and the rest of the contest entrants! For the rest of the top ten, additional information, and discussion, visit the forum topic! We'll be announcing the winners of the Darkness & Light animation contest this Saturday, September 19 at 8 pm UTC! To participate in the live event, go to the "chat room" link at the bottom of the community section of the forum. The chat room is IRC-based, and can be accessed via at irc.tawx.net at the #brickfilms channel. During the live chat, we'll announce the top ten films as decided by our judges, including our four contest winners. These results will be published on the website afterward. Thank you to everyone who supported this contest by entering it, and to our judges! Marc-Andre Caron is holding the second annual Ciné Brique festival, a live film festival event in Laval, Quebec, where brickfilms will be shown and awarded prizes. It's sure to be a fun event for brickfilmers, and you are encouraged to submit your films to the festival! For more details, see Caron's Ciné Brique 2015 announcement topic on the forums or visit the Ciné Brique website. Welcome, everyone, to the most magical time of the year! After 5 years, the annual-when-it-suits-us Septemberfest contest is back, and more ambitious than ever. In fact, it’s too big for just one month! That’s why this contest will be running from the 1st September to the 31st October 2015! If you’d like to take part in the celebrations and have a shot at some incredible prizes, check out the forum thread here! 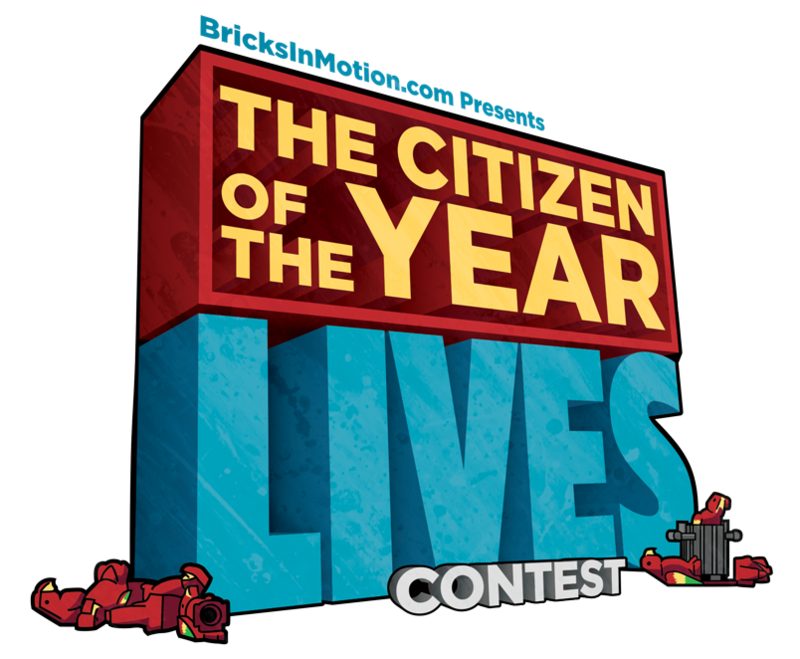 It's time for a sneak peak at the next BricksInMotion.com event, the upcoming The Citizen of the Year Lives contest run by longtime brickfilmer and BiM staffer Sean Warton. Look for the full competition announcement and contest details right here on Tuesday, September 1st! If you're new to Septemberfest, an annual celebration of the classic brickfilm The Citizen of the Year, watch the film that started it all to see what this is all about. As our summer animation contest Darkness and Light comes to a close, it's time for a look back at what brickfilmers have achieved in lighting and cinematography over the years, and explore some possibilities for the future! It can be easy to fall into the trap of settling for flat, evenly exposed lighting on your film, regardless of the content of its story. There is a a place for high-key lighting, but with the advent of DSLRs, high quality webcams, and instant online HD video publishing, making sure that everything can be seen clearly in your finished film isn't the challenge it used to be. The exciting thing about these advances is that they open up opportunities to explore bold, creative lighting design in our films. We can use multiple light sources with color and careful composition to paint with light, much like a live action cinematographer does. Read the rest of this article and discuss lighting in brickfilms on the forum! This week’s Brickfilm of the Week is Reputation by Colin Boyle. Watch Reputation on YouTube, then head over to the spoilery discussion thread to discuss with your fellow brickfilmers! This week’s Brickfilm of the Week is About A Door by Holger Imig. About a Door is a 2004 comedy satire brickfilm by Holger Imig. It follows the story of a door not to be opened and the public controversy surrounding it. It was an entry into the A Peculiar Event Contest and ultimately placed 6th. About a Door proved to be very influential in early Brickfilms.com culture, and spawned many parodies and homages. Watch About a Door on YouTube, then head over to the spoilery discussion thread to discuss with your fellow brickfilmers! BiM member SlothPaladin, creator of recent brickfilms such as Beyond the Eleventh Dimension and Subterranean, has written a guide for animating figures in the often confined spaces of a brickfilm set. To check out his tutorial and share your thoughts, visit the tutorial forum topic! 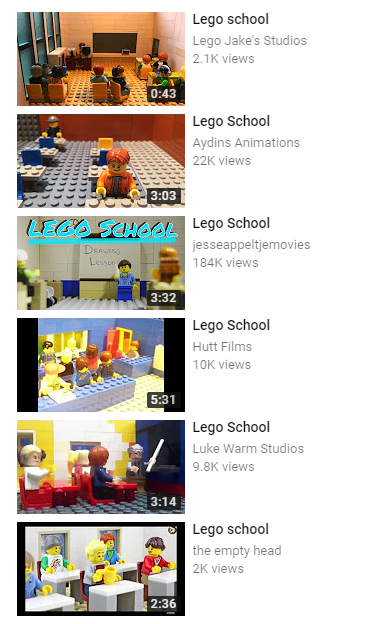 Watch Found on YouTube, then head over to the spoilery discussion thread to discuss with your fellow brickfilmers! This week’s Brickfilm of the Week is Money by Dave Wardell. Money is a 2005 comedy brickfilm by Dave Wardell. It is about an impoverished Ralph and Rupert attempting to withdraw the last of their money from the bank but getting mistaken for bank robbers. It is the fourth film in the Ralph and Rupert series and also stars characters from Wardell's film Stop! Thief! Watch Money on the Brickfilm Archive, then head over to the spoilery discussion thread to discuss with your fellow brickfilmers! This week’s Brickfilm of the Week is The Crow and the Fox by "France and Alex". The Crow and the Fox is a retelling of the fable The Fox and the Crow by Jean de La Fontaine. It was made by French brickfilming team "France and Alex" in 2006. "France and Alex" are also known for Gaston's Odyssey and Bestia. Watch The Crow and the Fox on YouTube, then head over to the spoilery discussion thread to discuss with your fellow brickfilmers! This week’s Brickfilm of the Week is VIRUS by Fred Mangan. VIRUS is a unique brickfilm focusing on brick-built robot characters who live inside a computer. It was made in 2011 and has remained little-known within the brickfilm community. Watch VIRUS on YouTube, then head over to the spoilery discussion thread to discuss with your fellow brickfilmers! This week’s Brickfilm of the Week is Onorno by Bert Loos. Onorno is a comedy brickfilm about two men who argue over what is written on a sign they are viewing from opposite sides. It was made by Bert Loos in 2005, andwas an entry to the first Twenty-four Hour Animation Contest and placed thirteenth in the judges' choice and eleventh in the entrants' choice. Bert Loos was a member of Brickfilms.com and is a member of Bricks in Motion. He greatly helped the Brickfilms Archive project when he provided thousands of archived brickfilms to the organizers, some of which had thought to have been lost forever. His other films include About Rapunzel, Storyline Buildup, and Da Europeans. Watch Onorno on YouTube, and then head over to the spoilery discussion thread to discuss with your fellow brickfilmers! This week’s Brickfilm of the Week is Blambo Part II by Logan Dwight and Ian Hirschfeld. Blambo Part II, also known by its full title The Chronicles of Blambo Part II: The Epic Battle of Ameripan vs Super Chindia - Special Edition Director's Cut, is a comedy action brickfilm by Logan Dwight and Ian Hirschfeld. It was made in 2005 for the Heroes and Villains contest, and ultimately placed 9th. It was also nominated for two awards in the 2005 Brickfilming Achievement in Motion Picture Arts. Watch Blambo Part II on Youtube, and then head over to the spoilery discussion thread to discuss with your fellow brickfilmers! This week’s Brickfilm of the Week is Reality (What a Concept!) by Mark Butler. Reality (What a Concept!) is a drama brickfilm by Mark Butler about a man who has destroyed reality. It was made in 2004 for the A Peculiar Event contest and ultimately won third place. Mark Butler was a member of Brickfilms.com, and only made three films: Reality (What a Concept! ), Extreme Preparation, and Extreme Delivery. Watch Reality (What a Concept!) on the Brickfilm Archive, and then head over to the spoilery discussion thread to discuss with your fellow brickfilmers! This week’s Brickfilm of the Week is 2001: A LEGO Odyssey by Marc Atkin. 2001: A LEGO Odyssey is both a homage to the 1968 film 2001: A Space Odyssey and to the LEGO building toy and spans several eras. It was made in 2001 by Marc Atkin. Marc Atkin was a member of the early LEGO fan site LUGNET, and his films were in the Brickfilms.com directory. His only other film is Jar Jar Binks and the French Revolution. Watch 2001: A LEGO Odyssey on the Brickfilm Archive, and then head over to the spoilery discussion thread to discuss with your fellow brickfilmers! 2014 Bricks in Motion Awards Winners! And here they are, the winners to the 2014 Bricks in Motion Awards. Congratulations to all of the winners and the nominees! Zach and I are extremely happy that we have been able to bring back the Bricks in Motion Awards to everyone, and we'd especially like to thank our fellow judges: Littlebrick, Dewfilms, sillypenta, and Squash, with help from AquaMorph and Smeagol. Go to the thread on the forums to check out the winners! This week’s Brickfilm of the Week is Beast by Nathan Wells. Time to be a little self-indulgent! It’s my birthday next week so I thought I’d be selfish. Beast is a horror myster brickfilm about Dr. Wilson, a scientist who will do anything to find a cure for cancer and must deal with the sudden murder of his lab assistant. It was made by me, Nathan Wells, in 2006 for the Fame, Infamy and Glory Contest, and ultimately won second place. Beastwas also nominated for Best Sound Design in the 2006 Brickfilming Achievement in Motion Picture Arts Awards. I was an active member of Brickfilms.com from 2005 to 2008, and have been active on Bricks in Motion since its founding, save for a “short” hiatus. My other films include Alex and Derrick: Five Years Later, 30 Years: The Story of the Minifigure, Blinders, Unsound, andInfinity Squared. Watch Beast on YouTube, and then head over to the spoilery discussion thread to discuss with your fellow brickfilmers! The 2014 Bricks in Motion Awards - Awards Chat Announcement! The time has come! Over the last few months, our panel of judges have debated and discussed, and we've finally come to a consensus. The winners of the 2014 Bricks in Motion Awards have been chosen, and now it's time to reveal them in style. On June 13, 2015, at 2 PM Pacific Standard Time, we will announce the winners in the Bricks in Motion IRC chatroom. You can see what that is in your time zone by clicking here. You can learn more and check out the entire list of nominees in this thread. This week’s Brickfilm of the Week is Fallen: Part One by Brendan Henry. Fallen: Part One is a drama brickfilm about an angel and her fall to earth. It was made by Brendan Henry in 2005 and was nominated for four Brickfilming Achievement in Motion Picture Arts awards, including Best Overall Film. Brendan Henry was a well-known member of Brickfilms.com, and occasionally still posts to Bricks in Motion. His other brickfilms include Triumph of the Empire, Bounty, and the two Norseland Saga films. Watch Fallen: Part One on the Brickfilm Archive, and then head over to the spoilery discussion thread to discuss with your fellow brickfilmers! 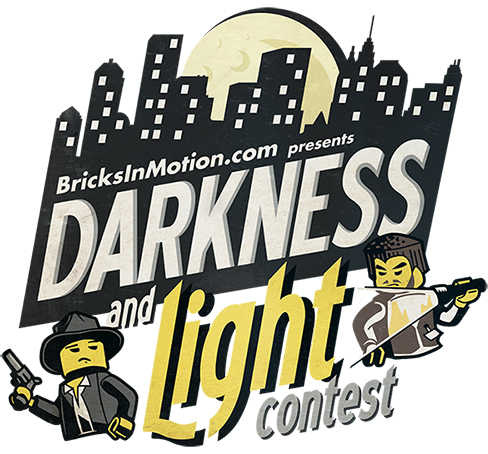 Announcing Darkness & Light, the Bricks in Motion 2015 Summer contest! The theme of BricksInMotion.com’s 2015 contest is Darkness and Light. This week’s Brickfilm of the Week is Great Microbiologists by Joshua Leasure. Great Microbiologists is a comedic educational brickfilm about the history of microbiology and notable microbiologists. It was made by Josuha Leasure in 2003 and features features European members of the Brickfilms.com community voicing the historic microbiologists in their native languages. Josuha Leasure, known as RevMen, was the owner of Brickfilms.com from 2003 to 2007, and has made several other brickfilms, including Diplomacy I & II, The Battle of New Orleans, and System Reboot, a co-production with Robinson Wood. Watch Great Microbiologists on the Brickfilm Archive, and then head over to the spoilery discussion thread to discuss with your fellow brickfilmers! "The Batmobile ran over Two-Face and that was the end. After clicking through the pictures rapidly and getting the illusion of motion, that little taste of animation had me hooked and I’ve been animating ever since." Read the rest, and discuss brickfilming at live sporting events here! This week’s Brickfilm of the Week is Mirrored Perspective by Zach Macias. Mirrored Perspective follows the story of a man trapped in dark chamber, with only his reflection to keep him company. It was made by Zach Macias in 2006 and ultimately was nominated in four categories in the 2006 Brickfilms Achievement in Motion Pictures Awards, including Best Film. Zach Macias is a staple of the brickfilms community, both as a long-time member of Brickfilms.com and Bricks in Motion. He currently is running the 2014 Bricks in Motion Awards with Nathan Wells, and has made many films, including The Profession, Sinner Monologues, Stranger Than Fishin’, and nine films featuring his characters Ben and Andy. Watch Mirrored Perspective on YouTube, and then head over to the spoilery discussion thread to discuss with your fellow brickfilmers! This featured brickfilmer post is part of a series of articles highlighting animators who supported the Bricks in Motion Documentary project on Kickstarter. Read the rest, and discuss Carlson's work here! This week’s Brickfilm of the Week is Zap by David Betteridge. Zap is a music video for a song of the same name by the band Ether Real and was commissioned by the band's record label Truelove Records. It is the first known brickfilm that wasn't commissioned by The LEGO Company to receive a wide public release as it was shown by MTV and other music channels upon release. It was created by David Betteridge and is his only brickfilm. Betteridge claims the film was released in 1989, but this is debatable as the song Zap was not released until 1991. Watch Zap on YouTube, and then head over to the spoilery discussion thread to discuss with your fellow brickfilmers! Jumpei Mitsui is a Japan-based sculptural artist, one of 12 LEGO Certified professionals in the world. He began playing with bricks when he was three years old, and built continuously from there. In high school, he began to find ways of building sculptural models, which appeared on several Japanese television shows. Read the rest, and discuss Mitsui's work here! This week’s Brickfilm of the Week is Hit & Run by Nick Maniatis. Hit & Run depicts a man being called to a meeting place and the events surrounding this from multiple viewpoints. It was made in 2004 by Nick Maniatis for the A Peculiar Event contest on Brickfilms.com, and ultimately placed second. Nick Maniatis was a well-known member of Brickfilms.com and is also known for making Good Company, Interference and Dare to be Different. Watch Hit & Run on YouTube, and then head over to the spoilery discussion thread to discuss with your fellow brickfilmers! "Even though I liked LEGO just fine as a kid, it was the brickfilming community that made me into a fan of LEGO. I think that LEGO and animation are perfect for each other, with both if you can imagine it, it can be achieved." Douglas's most recent film is That Spy. To discuss this brickfilmer, visit the forum topic! This week’s Brickfilm of the Week is Writer's Block by Kevin Horowitz and Jacob Schwartz. Writer’s Block follows the story of a writer who is transported to a surreal world after he gets writer's block. It was made in 2007 by Kevin Horowitz and Jacob Schwartz for their school’s film festival, where it won Best Animated Film. It also was nominated for many Brick Award for the Film Arts awards (a precursor to the Bricks in Motion Awards) and won Best Director. Kevin Horowitz (Quigibo) and Jacob Schwartz (Fractalman) were two members of Brickfilms.com and also made films such as Flight of the Penguin and People Come In, Pizzas Come Out. Watch Writer's Block on YouTube, and then head over to the spoilery discussion thread to discuss with your fellow brickfilmers! "Brickfilming as been a great creative outlet (and a way to justify to people the large amount of LEGO I have). Watching other people's films as well as making them myself is a great joy to me and I hope to continue Brickfilming for as long as I live. (However unrealistic that may be)"
One of Keiter's most recent films is the sci-fi short The Phantom Doctor. Brickfilm of the Week: Little Guys! This week’s Brickfilm of the Week is Little Guys! by David Pagano. Little Guys! is a faux-commercial made in the style of a 1980s toy commercial advertising a fictional toy known as Little Guys. It was made in 2007 by David Pagano and went on to win two Brick Award for Film Arts awards: Best Film and Best Animation. David Pagano was a Brickfilms.com member, and is currently a Bricks in Motion member and is the co-creator of The Set Bump, a blog about brickfilming. He frequently works with The LEGO Company to produce promotional short films featuring LEGO. His personal projects include Playback and the in-production follow-up to Little Guys!, Little Guys in Space! Watch Little Guys! on YouTube, and then head over to the spoilery discussion thread to discuss with your fellow brickfilmers! "With help from the extremely supportive community , I improved more in one year the I had in the four years I had been brick filming all together. After getting involved in contests like BRAWL and THAC, I discovered my love for oddball-ish dark humor, which is likely the result of an questionable parental decision to raise me on Monty Python's Flying Circus." To read the rest and discuss this brickfilmer, visit the forum topic! This week’s Brickfilm of the Week is Cognizance by Michael J. Green. Cognizance is a music video set to the Coldplay song “Don’t Panic” and tells the story of an assassin who is reassessing his career and life choices. Unlike some music videos in the future, this music video is purely a fan creation, and not sponsored by Coldplay. It was made in 2005 by Michael J. Green for his high school senior project, where it was chosen was one of the top three projects. Cognizance was also nominated for four awards in the 2005 Brickfilms Achievement in Motion Pictures Awards (a precursor to the Bricks in Motion Awards), including Best Overall Film. Michael J. Green, typically known as Cometgreen, was a well-known member of Brickfilms.com and was also a notable moderator. He made a few other films, including returning in 2011 to release another music video (LCD Soundsystem - All My Friends), but Cognizance is his most-known brickfilm by far. Watch Cognizance on YouTube, and then head over to the spoilery discussion thread to discuss with your fellow brickfilmers! Lewis Chen (Lechnology) is an animator whose work in the past few years has focused on computer animation. Since he sawThe Phantom Menace as a child, Lewis has had an interest in computer animation and visual effects. In 2002, he got into brickfilming in high school when a friend showed him a class project that was created using stop motion and LEGO. "I want to make brickfilms, I just don't have the space or resources to make them. While CG animation opens the door to creativity, I really wanted to make LEGO-based animation so I committed and specialized in CG brickfilms. Plus it was better than being hunched over a table in my attic with hot lamps during the hot summers that I had time to do stop-motion." This week’s Brickfilm of the Week is The River by Nikolas Jaeger. The River follows the story of a man who finds himself travelling down a river to an unknown destination. It was made in 2009 by Nikolas Jaeger for the Space, Time and Reality Contest hosted on Bricks in Motion. It won first place, and was also nominated for six Bricks in Motion Awards, winning all but two of them. Nikolas Jaeger, known as Night Owl, was a member of Brickfilms.com and Bricks in Motion and made other memorable films including Night of the Tater, Bill Carney’s Body andHastings. The River is his last film. Watch The River on YouTube, and then head over to the spoilery discussion thread to discuss with your fellow brickfilmers! Neal Tovstiga (Mr Vertigo), 18, is an animator currently living in the UK. He first learned about brickfilming some seven years ago when he came across LEGO animations on YouTube. Having had an interest in LEGO since childhood, the medium appealed him, but he didn't decide to take it up for himself until 2012 when he was inspired by the work of Harrison Allen (BiM member Squid); he specifically cites Pirates Rule! and How Not To Rob A Bank. He joined Bricks in Motion and his first Brickfilm, The Time Machine, was made for a local youth festival contest and screened at a local cinema. He later made Monochrome and Loyalty, for the Contrast and BRAWL competitions on the Bricks in Motion forums. His current project is a brickfilm called Seven Assassins, for which he recently released a trailer. This week’s Brickfilm of the Week is Men O' War by Isaac Botkin. Traditionally, nearly all brickfilms are made with actual, physical LEGO (or similarly) pieces, using stop-motion to make the characters and objects move. Over the years however, brickfilms made with digital LEGO and computer animation have been made. Men O’ War, animated by Isaac Botkin, is one of the most impressive CGI brickfilms. Released in 2006, this brickfilm made a splash and was eventually nominated for a Best Visual Elements award in the 2006 Brickfilms Achievement in Motion Pictures Awards. This is Isaac Botkin’s only brickfilm, and was made with the help of many other members of the Botkin family. Watch Men O' War on YouTube, and then head over to the spoilery discussion thread to discuss with your fellow brickfilmers! "After watching Spider-Man 2 as a six year old on a plane, I fell in love with movies, not sure at the time at what capacity I wanted to make them. I discovered brickfilming as an alternative art form to start making grand adventures on a smaller budget." To read more and discuss this brickfilmer, visit the forum topic! This week’s Brickfilm of the Week is The Artist by Mirko Horstmann. Instead of looking outward toward the wide world, many films turn inward to examine the process of filmmaking, artistry and creativity. The Artist, by Mirko Horstmann and released in 2007, is one of those films. This quiet film follows the struggle of a sculptor attempting to get into an art gallery, and probably resonates with any creative person who’s had to deal with trying to get their artwork accepted. The Artist won Best Film in Steinerei 2007 (a German brickfilm film festival) and first place in a Brickfilms.com contest simply known as the TTC Contest (a contest designed to promote the Theora video codec). Mirko Horstmann was a well-known German member of Brickfilms.com, and also made a few other brickfilms, including Greedy Bricksand The Fisherman and his Wife. Watch The Artist on YouTube, and then head over to the spoilery discussion thread to discuss with your fellow brickfilmers! The Bricks in Motion Awards are Back! Hello and welcome, one and all! After a momentary hiatus (read: 3 years), Nathan Wells and Zach Macias are proud to present the nominees for the 2014 Bricks in Motion Awards! This is a (sort of) annual awards event that recognizes and celebrates excellence in brickfilming in a wide variety of categories and disciplines. Think like the Oscars for brickfilms. Check out the announcement thread to read up on all of the nominees! This week’s Brickfilm of the Week is The Peril of Doc Ock by Tony Mines and Tim Drage. This was it. This was the moment that many brickfilmers got their first taste of just how expansive, dynamic, cinematic and professional brickfilms could look. Sure, Tony Mines and Tim Drage has made other great brickfilms before, most of them for the LEGO Company, but The Peril of Doc Ock is arguably the first professionally-produced brickfilm that captured the adrenaline-pumping action of a Hollywood blockbuster. Released in 2004, The Peril of Doc Ock made a big splash in the brickfilm community, and influenced many brickfilmings including Zach “MindGame” Macias. Tony Mines and Tim Drage, the talent behind Spite Your Face Productions, also created brickfilms like All of the Dead and One: A Space Odyssey before getting their big LEGO break with Monty Python and the Holy Grail in LEGO. This grabbed the attention of The LEGO Group, and Spite Your Face went on to make The Han Solo Affair and The Peril of Doc Ock for The LEGO Group. Watch The Peril of Doc Ock on YouTube, and then head over to the spoilery discussion thread to discuss with your fellow brickfilmers! Michael Tourette (HoldingOurOwn) is an enthusiast of toys and 1980s culture, a LEGO animator, and a married Catholic and father. He received his first Lego set in the 1970s, at the age of 3. He returned to Lego as an adult in 1999 with the release of Lego's first licensed property: Star Wars: Episode I. Tourette first became interested in Brickfilming after discovering the medium in a 2011 issue of BrickJournal. After reading about it, he began watching brickfilms online. Of the brickfilms he watched, Chris Allbee's Joe Brickmond was what inspired him most. He praises the series for its deep characterization. Read the rest, and discuss this animator! This week’s Brickfilm of the Week is Robota by Marc Beurteaux. Typically, brickfilming is a fairly insular hobby. Brickfilmers know of each other and other brickfilm’s work, but it’s rare for brickfilmers to break out into other notable work, and it’s equally rare for other filmmakers indulge in brickfilming. Marc Beurteaux, an animator and director from Canada, is an exception. His film Robota is his only brickfilm, but he’s contributed animation to TV series and shorts. Robota made the festival circuit and has won many awards, all detailed on the Brickfilms Wiki page here. Robota is follows the story of a broken robot trying to survive in a robot world, and features large puppets built out of LEGO and other construction toys. It features some of the biggest models and sets ever seen in a brickfilm. Watch Robota on the Brickfilms Archive, and then head over to the spoilery discussion thread to discuss with your fellow brickfilmers! Avery Drake has been making animations since 2009. He has had a lifelong interest in animation and in filmmaking, and is currently pursuing it at West Liberty University, studying Digital Media Design. This week’s Brickfilm of the Week is The Letter by James Maduzia. Comedy is a strange, fickle beast. Everyone has different opinions on what is funny, and what isn’t funny. Different styles of comedy come and go, but if you’ve ever sat in a film class or movie theater and watched the old classic films by Buster Keaton and Charlie Chaplin, you’ll realize that good old slapstick will always entertain. The Letter is the perfect encapsulation of classic slapstick in LEGO form. Released in 2003, this brickfilm quickly became an instant classic, and has often been cited in articles about brickfilming. James Maduzia made one other brickfilm Zero Gravity Rebellion, also a classic, and was interviewed by Brickfilms.com. While he only made two brickfilms, they both made a big impact on the brickfilms community. Watch The Letter on YouTube, and then head over to the spoilery discussion thread to discuss with your fellow brickfilmers! Jack Campise began making videos in 2007. In that time, he has made a number of brickfilms and short live action films. In 2012, he used crowdfunding to raise funds for a Batman fanfilm which he would spend the next three years completing, The Legend of the Bat. This week’s Brickfilm of the Week is Dr. Jobs and his Scary Laboratory by Fumitaka Anzai. Brickfilming is, like LEGO itself, an international phenomenon. Our beloved plastic bricks transcend international borders and language barriers with ease, and we’ve seen brickfilms and brickfilmers from around the world. However, while we’ve seen plenty of brickfilms from North America, Europe and Oceania, we’ve essentially seen no brickfilms from Asia. Dr. Jobs and his Scary Laboratory by Fumitaka Anzai is an exception. Released in 2005, this brickfilm caused a stir thanks to its impressive visual effects and extremely smooth animation that essentially had never before been achieved with LEGO. While Fumitaka Anzai did post this film on Brickfilms.com, he was not an active member, and very little is known about him. Watch Dr. Jobs and his Scary Laboratory on YouTube, and then head over to the spoilery discussion thread to discuss with your fellow brickfilmers! After months of preparation, I am pleased to announce the Brickfilms Wiki. Thanks to the fantastic work of sillypenta and BoatsAreRockable, and the assistance of rockydude411, dewfilms, Squash, AquaMorph and Rioforce, we're proud to present a community wiki designed to catalog notable brickfilms and brickfilmers. The Brickfilms Wiki is open to all to edit and contribute, but, like all wikis, contributors must follow our Code of Conduct and Formatting Guidelines. Not every kind of page will be accepted, and the wiki core team (myself, Penta and Boats) will be keeping an eye on the wiki to make sure the wiki retains its high standards. Check out the annoucement thread with more info here! This week’s Brickfilm of the Week is Pertinacity by Christoph Brock. Pertinacity follows the story of a gray swan trying to get the attention of a white swan. Pertinacity was made in 2004 for the Ten Bricks Contest, a contest that challenged brickfilmers to animate a short brickfilm using a maximum of 10 bricks total. It won second place, but since Christoph Brock was also a host of the contest, the second and third prizes were passed down to the third and fourth places. Christoph Brock, known as Brickbrock, was an early active member of Brickfilms.com, and made several other brickfilms including A Quiet Evening and X-Mas Golem. Watch Pertinacity on the Brickfilm Archive, and then head over to the spoilery discussion thread to discuss with your fellow brickfilmers! Zac Bucklin, 20, has been a filmmaker since 2012. He has been inspired by Sean Willets, Nathan Wells, and "Fancy Pants". Some of his recent projects include BrickBits: The Re Bricks Edition and The Bricktastic Misadventures of Zac & Jake. Zac says: "I've begun to take my animating more seriously and started to plan ahead on my next set of projects." This week’s Brickfilm of the Week is Twelve Bucks by Rob Weychert. Twelve Bucks follows the story of a man who takes a job at a cereal-making factory. But all is not as a it seems. Twelve Buckswas made in 1998, before Brickfilms.com was even established, and is one of the earliest brickfilms with a clearly defined narrative story, along with The Magic Portal and the films of Dave Lennie and Andy Boyer. It appears Rob Weychert was never a member of Brickfilms.com, and his website, Bredstik.com, hasn’t been updated since 2003. Twelve Bucks is Rob Weychert’s third and final brickfilm, and easily his most notable. Watch Twelve Bucks on YouTube, and then head over to the spoilery discussion thread to discuss with your fellow brickfilmers! Iver Jensen, 18, is a filmmaker based in Norway. Together with his brother Jakob, Iver has made brickfilms actively since late 2009 under the nickname Soppenjim. They were inspired by "legends such as Zach Macias, Nathan Wells, Doug Vandegrift and Philip Heinrich." Some of his recent projects include The Jolly Adventures of the Men Who Travelled In Time and Reliance. This week’s Brickfilm of the Week is Aladibababad by Jonathan Hellerman and Nathanael Hellerman. Aladibababad follows the story of young Arabian knight Aladibababad and his adventures with a band of thieves and a magical bottle. It was made in 2004 for the High Adventure Theatre Contest on Brickfilms.com and ultimately won first place. Brothers Jonathan Hellerman and Nathanael Hellerman, typically known collectively as Leftfield Studios or the Leftfielders, were members of the Brickfilms.com community from around 2002 to 2009, though they did continue to make brickfilms until 2012. They have made around 20 brickfilms, including Fred’s Day, Special Deliverance, and Star Wars: The Great Disturbance, one of the longest brickfilms ever made. Watch Aladibababad on YouTube, and then head over to the spoilery discussion thread to discuss with your fellow brickfilmers! Tobias Nikl, 15, is a filmmaker based in NYC and orginally from Prague, Czech Republic. He joined th BiM Community in 2010 and met some inspirating filmmakers through the site. He currently attends an art high school, where he's studying Film & Media. Some of his recent projects include The Man in Red and Blue and The Competition. The Competition has brought Nikl some success. Read the rest, and discuss this article! This week’s Brickfilm of the Week is Out of Time by Chris Salt. Out of Time follows the story of the duo of Mike and Geoff, who, out of boredom, go for a walk and encounter three time-travelling spacemen. It was made in 2003 and won the 2004 NWBrickCon animation competition. Christ Salt, also known as Oblong Pictures, Buxton and 0ldScratch, was an active member of Brickfilms.com and continues to occasionally post on BricksInMotion.com. He has made over 30 brickfilms, including Words of Wisdom and Bowling for Sandercoe. He also has collaborated with musicians to make LEGO music videos, and with the LEGO Group to make promotional videos, the latest being the Top Gear LEGO promo. Watch Out of Time on YouTube, and then head over to the spoilery discussion thread to discuss with your fellow brickfilmers! Ben Young, known on BiM as Sonjira, is a 17 year old animator whose began making brickfilms in the summer of 2011. Having drawn inspiration from Robinson Wood, Captain Bulldog, and Doug Vandegrift, he decided to get into the hobby after deciding that "it couldn't be THAT hard." His first film that he got a lot of response for was BIRDFaCE, which inspired him to pursue the hobby more seriously. His latest project, A Fresh Start'N, has been celebrated by the community for its absurd humor, which drew inspiration from local advertising for grocery chains and other stores. It's an especially impressive project considering he made it for the BricksInMotion Twenty-four Hour Animation Contest. This week’s Brickfilm of the Week is The Hand of Fate by Dave Corbett. The Hand of Fate follows the story of Phil, a man who keeps seeing giant hands attacking his friends. It was made in 2004 and was an entry into the A Peculiar Event contest hosted on Brickfilms.com. It ultimately won first place. Dave Corbett, more commonly known as Digi_Dave, was an active member on Brickfilms.com during the site’s early years. He made only one other film, The Customer is Always Right. Watch The Hand of Fate on YouTube, and then head over to the spoilery discussion thread to discuss with your fellow brickfilmers! This featured brickfilmer post is the third in a series of articles highlighting animators who supported the Bricks in Motion Documentary project on Kickstarter. Marc-André Caron, aka MonsieurCaron, is a history teacher, husband, and father of two based in Québec, Canada. His earliest introduction to the hobby came in the form of various LEGO and Bionicle videos on YouTube, inspiring him to try making some films of his own. Soon, he was asked to make a video for his local Teachers' Union and commissions grew from there. He built his YouTube channel and made more film projects. With the help of QuéLUG (Québec LEGO User Group), he taught a brickfilming class that made a Jurassic Park parody video. One of Caron's recent projects is this LEGO Ghostbusters video. He says that while many outsiders enjoy it, he got some criticism from animators who didn't like the way characters slide around, something he did because he felt it added to the comedy. This week’s Brickfilm of the Week is The Gauntlet by Jay Silver. The Gauntlet follows the story of an imprisoned man who attempts to escape the lair of an evil wizard. It was made in 2001 and was originally conceived to be an entry into the Classical Movie Contest on Brickfilms.com, but it was not finished in time. Jay Silver, a Canadian brickfilmer, has been a staple member of the brickfilming community since 2001, and is appearing in the Bricks in Motion documentary. The Gauntlet was Jay Silver’s first released brickfilm, and he also made Rise of the Empire, Rapunzel, and The Journey, which recently won the Bricks in Motion Celebration Contest. Watch The Gauntlet on The Brickfilm Archive, and then head over to the spoilery discussion thread to discuss with your fellow brickfilmers! This featured brickfilmer post is the second in a series of articles highlighting animators who supported the Bricks in Motion Documentary project on Kickstarter. Walter Benson, 22, is an animator based in Florida. He loves cinema and LEGO, and sees brickfilming as a combination of these passions. Benson's latest project, That's The Way It Goes!, is a 20 minute short film with an episodic structure, and has been well received in the BiM community. Benson says he draws inspiration from LEGO vignettes, small scenes built from bricks that work to tell a small story. Winners for THAX XII have been announced. Thank you to Nathan Wells for running and sponsoring this year's competition, and congratulations to the winners! See the full top 10 and discuss in the forums! This week’s Brickfilm of the Week is Also Thwacked Zarathustra by Thomas Foote. Also Thwacked Zarathustra follows the story of a pack of monkeys that are terrorized by a hungry T-rex. It was made in 2001, when a slurry of other 2001: A Space Odyssey were also released. It premiered at Brickfest 2001. Thomas Foote, an American brickfilmer, was an early member of the Brickfilms.com community and was active roughly from 1999 to 2004, producing brickfilms such as The Big Match and Jake Technic. His personal site, BricksInMotion.com eventually lent its name and URL to our own beloved site. Watch Also Thwacked Zarathustra on YouTube, and then head over to the spoilery discussion thread to discuss with your fellow brickfilmers! This featured brickfilmer post is the first in a series of articles highlighting animators who supported the Bricks in Motion Documentary project on Kickstarter. Kris, also known as Bionicle28, is a 17 year old animator who, along with the rest of his family, forms Something's Awry Productions. He's produced several videos for the LEGO Group, most recently working on a pilot for a series of videos which explain how to make stop motion films using the LEGO Movie Maker app. He also worked on animated credits for the documentary Beyond the Brick. One of his most recent films is the impressive and entertaining short The Call of Farqunglu. THAX XII has begun. For full contest information over the next 24 hours, visit the announcement thread. Welcome to Brickfilm of the Week! This is a new weekly feature on Bricks in Motion. Every Friday, a brickfilm will be selected as Brickfilm of the Week to be featured on the main page of Bricks in Motion. The purpose of Brickfilm of the Week is to celebrate important, fun, influential, creative and noteworthy brickfilms and to draw attention to brickfilms that might have been forgotten over the years. Since it’s THAC (Twenty-four Hour Animation Contest) season, this week’s Brickfilm of the Week is His Master’s Plan, by Stefan van Zwam, the winner of the very first Twenty-four Animation Contest in 2005. His Master’s Plan follows the story of a servant, following the orders of his master, who breaks into a house to steal something valuable. Like all THAC films, it was made in under 24 hours. Stefan van Zwam, a Dutch brickfilmer, was a staple member of the Brickfilms.com community and was active from 2001 to 2007, producing brickfilms such as Animation Class: Lesson 1, Daedalus and Icarus, and his Great Inventors pair of films. His Master’s Plan was one of Stefan van Zwam’s last brickfilms. Watch His Master’s Plan on YouTube, and then head over to the spoilery discussion thread to discuss with your fellow brickfilmers! Here it is: the first teaser trailer for Bricks in Motion: The Documentary. If you like what you see, the film is still available for pre-order here. Pre-order money will be put directly into the budget of the film, allowing us to afford more interviews and bigger sets for the film's upcoming animated portions. We've also got some other reward options available. The upcoming edition of the Twenty-four Hour Animation Contest has been announced! Visit the forums for more details. The fundraising campaign for Bricks in Motion: the Documentary on Kickstarter has ended, raising $12,800 from 270 backers! We're excited by the success of the campaign, and grateful to the BiM community for making this happen. In order to make the film the most ambitious and successful project it can be, however, we'd like to aim higher. 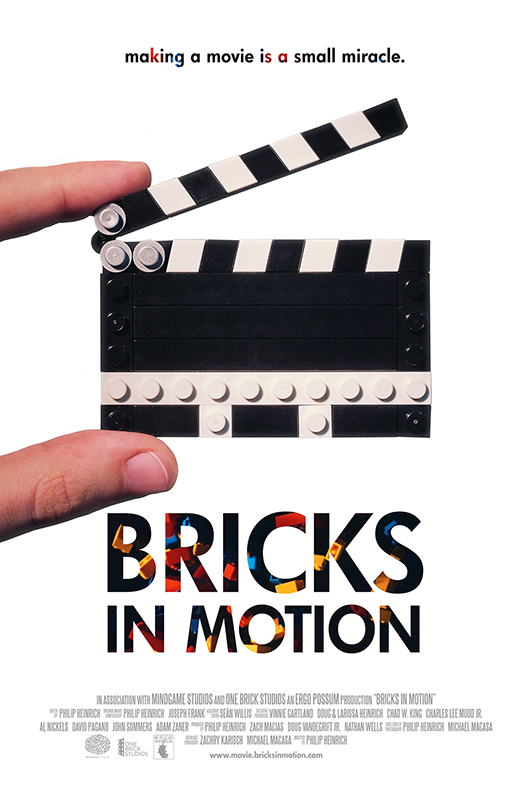 Bricks in Motion: The Documentary is a feature length film about the world of stop motion LEGO® animators. We'll explore the personalities and lives of various filmmakers around the world. In return for your support, we're offering a number of exclusive rewards, including the Bricks in Motion Collection, a DVD and Blu-ray of classic films from the Bricks in Motion community, with new director commentaries! It will also showcase all the entries to the recent BiM Celebration contest. To learn more about the rewards or make a pre-order, visit the BiM Documentary discussion thread. Results for the BiM Celebration contest have been announced! Visit the discussion topic here for the full listing. Congratulations to the winners: jay, PushOverProductions, and Galen5055! Bricks in Motion: The Documentary Kickstarter! The Bricks in Motion Documentary Kickstarter campaign has launched. We're making a documentary about the world of brickfilmers, and we need your help to make it happen! In return for your support, we're offering a variety of cool rewards, including custom sets designed by Nathan Wells, copies of the documentary when it's complete, and a collection of classic films on DVD and Blu-ray with new director commentaries. For more information, check out the Kickstarter, or discuss the documentary on the forums here. We've launched a new contest: create a 30-second short film, and it will be included on the first Bricks in Motion DVD film collection. For full contest details, head to the announcement thread. The deadline for this competition is September 6! The 2014 edition of the popular week-long BRAWL animation contest run by community members is soon to begin, starting July 20! For more information, check out Fun Sucker's announcement thread on the competition. Good luck! Forum member LASF has organized a 2014 round of the EASTER animation contest. For details, check out the forum thread. THAC 11, coming December 28/29! The 11th Twenty-four Hour Animation Contest begins December 28. Check out the full announcement for contest rules, prizes, and more! This year's prizes are sponsored by Brickworld. Forum member Squash has launched an unofficial summer brickfilming competition! Check out the contest details in the forum. The results of the most recent Twenty-four Hour Animation Contest have been announced. Check them out in the forums. The tenth Twenty-four Hour Animation Contest has ended, and the films in the contest are now available for viewing! Check them out in the releases forum. The annual Twenty-four Hour Animation Contest will be held later this month! See the forum thread for full details. BiM 2012: Kitchen Sink results! The results for the 2012 contest, Kitchen Sink, have been announced. Congratulations to the winners and thank you to the contest runner, legogod! After a year's silence, the BiM Awards are back. The results of this year's awards are available here! Many thanks to all the judges and filmmakers, as well as Jargon for organizing this year's event. The 2012 contest has been announced! Check out the announcement thread for full information! Long-time community member and animator for LEGO, David Pagano, is working on a personal brickfilming project and is looking for help! Our new film is called "Little Guys... In Space! ", and it's a stop-motion homage to ‘80s space toy commercials, featuring large-scale LEGO sculptures as the main characters. It’s a sequel to our 2007 film "Little Guys! ", which was created in a similar style -- all characters, sets, backgrounds, and effects built out of LEGO bricks and elements. With the new film, we're aiming to advance the techniques we developed for the first film: create more expressive characters, try out new brick-built practical effects, and generally push the boundaries of LEGO stop-motion as far as possible. We’re also looking to just make a fun, entertaining film that pays tribute to classic sci-fi archetypes and retro TV ads. To get the film made, we're currently raising funds for "Little Guys... In Space!" on Kickstarter. Rewards include custom LEGO kits, DVDs, pins, and prints, as well brick-built caricatures of our backers that will be featured in the film. Check out our Kickstarter campaign, and please consider supporting our film and helping spread the word! Forum member mcoov has announced a 2012 round of the 'EASTER' contest. For full contest details, see the announcement thread. Results for our 2011 contest have been announced. Check them out in the contest results thread. BiMA 2010 Viewers' Choice Voting! Voting is now open for the viewers' choice award for the best brickfilm of 2010. Better late than never! The judges have submitted their ballots and the results are in! The scores were all very close, so give yourself a pat on the back for making such great films in less than 24 hours. 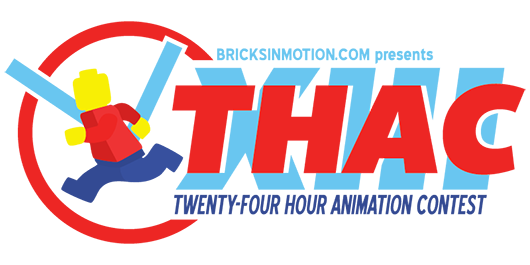 Thank you to our sponsor, Brick-A-Thon, who has graciously donated the prizes for this years contest! The 2011 contest has been announced. See the contest thread or the events page for details. The 8th Twenty-four Hour Animation Contest has been announced. Check out the details in this thread. The results of judging for the 2010 Septemberfest contest have been announced. Check them out here. Many thanks to all our entrants, and congratulations to the winners. The entries are in for Septemberfest! Check them out here. A new, month long contest for the duration of September has been announced. Check out the contest details here. The results for the BiM 2010 contest have been announced. Congratulations to Nick Durron, LGFB Studios, and A. for their wins! For links to the films, as well as more information and discussion, see the results thread. Check out the discussion thread for more information and discussion. Thank you to NXTManiac for organizing and overseeing the awards! The Nominees for the 2009 Bricks in Motion Awards have been announced! Visit the Events page to check them out. The 7th Twenty-four Hour Animation Contest has been announced, and will be held on January 2nd-3rd, 2010. Check it out in the forums! Results for round 2 of AniExer-size have been announced. Leonardo has produced a promotional video for the ongoing BiM 2010 contest. The second round of the AniExer-size Contest has been announced! Don't forget to check out the contest video. 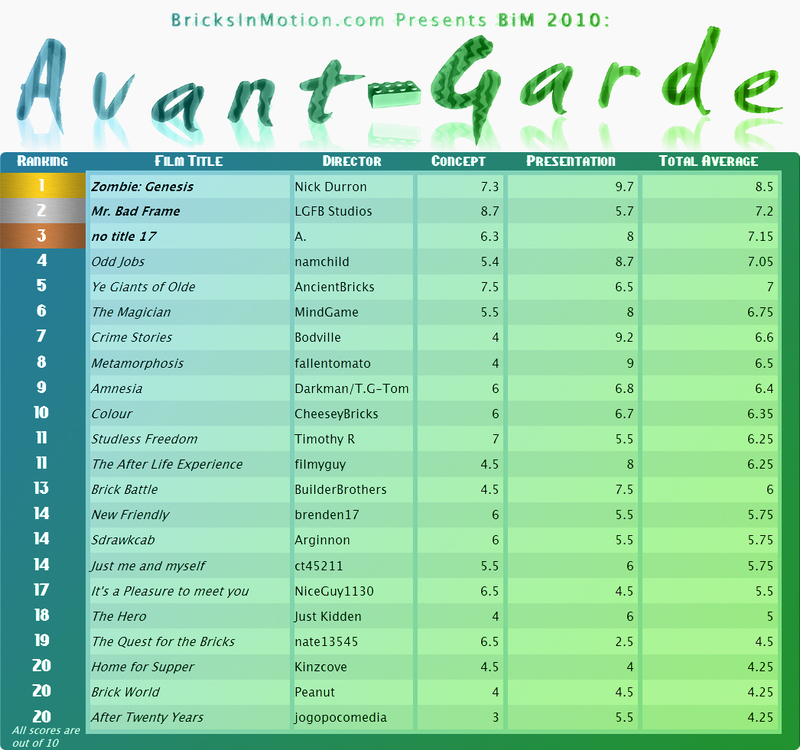 The BiM 2010 Contest has been announced, and the theme is Avant-Garde. For full details, visit the contest discussion thread or the events page. Results for the contest have been announced in the contests forum. Also check out the results video. STAR Results have been announced! Thank you to the other judges (Noodle, Keshen, 0ldscratch, in addition to myself) and to all our entrants for support of the contest. Thanks as well to Cheshire for agreeing to donate the 1st prize. Congratulations to everyone who completed a film for this contest and especially to the winners. Full results and scoring in the discussion thread. BiM Awards Organizer NXTManiac has put together a recap video of the 2008 BiM Awards. 2008 Bricks In Motion Awards Results! Congratulations to all the nominees and winners, you all did a great job with your films! Also, thanks to Smeagol, VN, MindGame, and Yanzl for announcing some winners during the Live session. The results for the STAR contest will be announced on Saturday, August 15th, at 8:00 PM UTC. Visit the discussion thread for details. After some delays, the nominees for the first ever Bricks in Motion Awards have been released. Check out the events page or visit the discussion thread. Winners will be announced live next week! BiM member VN has announced a new contest, sponsored by eBricksOnline.com. Visit the contest forum topic for details, or go straight to the announcement video. Announcing the STAR Live Premiere! After the STAR Contest deadline passes on Sunday, July 26, the STAR Live Premiere will commence! Visit the link for details. The STAR Trailer Contest has begun. The deadline is July 19th, so if you're entering the STAR Animation Contest, check it out! 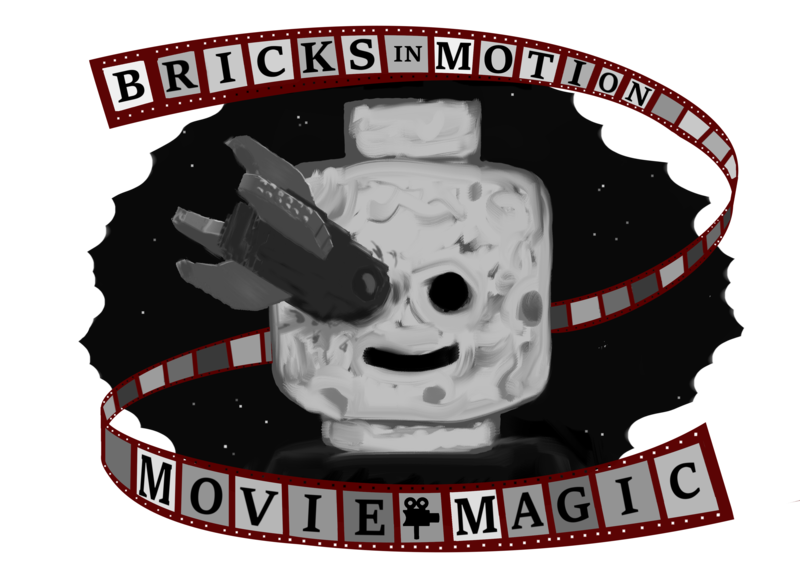 Bricks In Motion T-Shirts are now available in the BiM Store! If you want one, we recommend ordering during the preordering period to ensure you get your preferred color and size. Preorders end June 10. The Film Directory is Now Open! The BiM Film Directory is now open! See this thread for some basic info on using the new directory. I would like to thank Chris Boyer (SlothPaladin) for the immense amount of work he has put into programming this directory over the last few months. It was a big commitment for him to spend his free time programming this site after working on other site programming during the workday. Completing the directory in a timely manner and with good results would not have been possible without him. The beta testing team was also invaluable in testing the directory, providing feedback, and submitting their films as testing grounds for the directory. We would also like to recognize Jonathan Schlaepfer for his contributions and feedback. He laid much of the groundwork for the submission form and several other elements of the directory. The votes are in, and the results for the TEC Contest have been announced! Congratulations to 1st Place winner Yanzl and 2nd Place winner Timfee. Go to the forums to see a full listing. The Bricks In Motion 2009 Contest has been announced. Visit the Events page or the Contests forum for more information. When Philip (Sméagol) took over BricksInMotion.com I volunteered to build the new directory. I have been hard at work for the last two weeks and we would like to show you a screen cast of the submission form. Watch it in HD at Vimeo! At this point the two things that need to be finished before we can launch the directory are the view film page and the review panel system, the submission form was one of the biggest tasks and we hope to have the directory up very soon. After some delays in the completion of the site, the directory is now under construction, and we are working on a new resources section. Visit this thread for updates as development progresses. Hello and welcome to Bricks in Motion! We're still settling into our new home here so bear with us as we build our momentum! Now I know the front page, films page, and resources page look a little... well... lackluster, but there is a reason! For one, we don't have any reviewers yet, so we can't go about adding films until we get us some of those. And two, we don't have any content for the resources page yet. But that's okay, things will be opening up rapidly! If you're interested in reviewing films for us, please visit this thread for more information. If you're interested in helping out with the resources page, please visit this thread. If you're interested in submitting your films to our directory we ask that you please be patient for a few days more while reviewers are selected and trained for their position. I am proud to announce that BricksInMotion's first contest is officially underway! 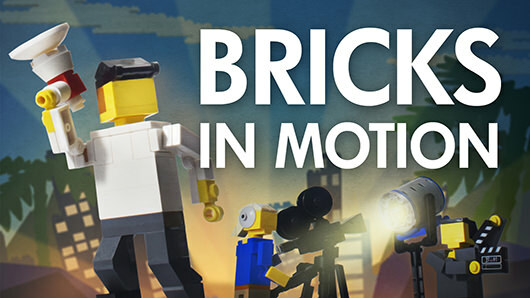 The Bricks In Motion Technical Excellence Competition is an annual event that we will hold to encourage filmmakers to pursue not only thrilling stories and high quality cinematography, but also stunning / complex stop motion animation. Entries are limited to 10-40 seconds long and must be entirely stop motion animated (masking out wires, etc. is okay but, for example, a 3D glass shatter would not, neither would anything greenscreened). In addition, all entries must contain no sound and must be only one camera shot. The idea is that you are focusing on the animation, not on anything else. The rules are strict and the panel of judges (consisting of Buxton, Dewfilms, and myself) will be even stricter. Every frame counts. All entries must be submitted before 12:00 AM PDT on August 13th of this year. For more specific rules (including some specifications for submissions) please visit the contest's page here. Or, if you would like to discuss the contest further, please visit the forum page here. P.S.- Just a hint for the judging, we will be grading on merit, so, for instance, a clip with a minifig jogging would not score as high as a car driving through a billboard. I received an email this morning from the "Adirondack Manufacturing Corporation" (of which Cynthia Price's (the current owner of brickfilms) husband is the President) claiming trademark infringement on the domain name "ilovebrickfilming.com" (infringement on the term "Brickfilms"). I suppose I should have seen this coming, and I apologize to all of you that warned me about this, I should have listened. I haven't decided a course of action yet and I would love any input from you fine folks. Obviously if they have a problem with "ilovebrickfilming" they'll have a problem with "brickfilmers" too so it's likely that we'll have to revote on a name. A discussion is going on in this thread on the forums. For those of you that are interested I have uploaded a formatted version of the email here. "Peaceful coexistance". Right. Things are moving very fast in the Brickfilmers.com development lane. The entire site is coming along marvelously (perhaps slightly ahead of schedule) and I'd like to start sharing a little more with you guys what the site will be like. :) So without further to do, I introduce to you the first Brickfilmers.com screencast (featuring the film addition page)! We're all really excited about this feature so let us know what you think about/want from it in the comments! P.S. Check out the new RSS feed! With the new site name / design / logo having been chosen (It'll look sort of like this) and my spring break now over, the new website is under construction! XHTML markup has been completed and the forums have already been integrated with the theme (it's awesome). We're working on putting together the film directory and private messaging systems and then we'll work on getting the resources and events underway. Hopefully the entire process will only take a week or two and we'll keep you updated on the progress! Thank you to all of you who are concerned about the contents of my personal site (Schlaeps.com) which was suspended during my sudden removal from Brickfilms. I received an email this morning (the 12th) with a link (and nothing else) to a .rar compressed version of the site within an ominous folder that indicated my files would be removed in 24 hours. I downloaded the rar (which took nearly all day on my rather miserable internet connection) only to find it was corrupted. Yay. So basically I have anything in my root folder than began with a-d. I emailed them again stating the issue but have not received a response back. I'll update you all as soon as possible. UPDATE: I have finally downloaded my websites directory and am awaiting news regarding my mysql database. Another problem has arisen though, it would appear that I am not the only one to have been ousted from their hosting domain. Another long standing patron has been given the dump without warning. I won't say their name or go into much more detail because they seemed extremely upset about the matter (and rightly so, they paid for the hosting). I've emailed "Zane" about a refund but I don't expect they'll return my replies. If you do find out who it is, please don't email them. For the record, I'm thoroughly mad about this now. This is what I know thus far. I've had very little response from the admins so I'm still unclear about how things happened. About a week ago when the changes to the search were made, I began to see a huge shift in the way Brickfilms was running. Dozens of members began crying out for answers from the site owners and only got their threads locked after being told to "Go BrickFilm". After seeing this and several parts of the site (including an upcoming youtube clone and what would appear to be the disabling of the wiki) begin to change dramatically like this I began to worry for the ideal of brickfilms as a whole. Whether or not this site would be the same place it used to be ever again. So I started working on another site. To be clear, I never wanted to directly "compete" with brickfilms. I just wanted to have a place to work on actually brickfilming rather than having ads thrust down my throat while the community goes insane from a lack of information. I called it "I Brickfilming" in light of this. I expected to be kicked from the site or to step down as admin after revealing it. I couldn't imagine that having something like that would make them very happy. Upon completing the placeholder for the site I sent a link to a forum member whom I trust very much and wanted to know some answers and what I planned to do about this. I responded with as many answers as I could and then gave her a link to the site. After that (and I'm just guessing on this part) the higher ups got a whiff of my site from someone (I'm not sure who or how) and then proceeded to either be given the contents of my private messages or search the database for them (I'm guessing the latter due to the person I was PMing with). Upon finding this I believe they waited a few days before disabling my website/hosting account here and then removing all privileges I had on the site. I never received any contact from the owners and was only told what a few ministers had seen in the Ministers forum (where the owners apparently explained everything). The only email I got was several hour after and concerned the removal of the brickfilms logo from the ilovebrickfilming.com site (which I had already done a few minutes before the email arrived). After replying to the email asking for answers I received a response basically confirming my beliefs in the above events and then said they tried to keep it from the community to "salvage my dignity". I'm not ashamed of what I did and I stand behind it fully. I leave it up to you to decide the ethics of the situation. Whether it was right of me to build another site devoted to the hobby. Whether it was right of them to search my PMs. Whether it was right to lock up my site and label me as a "wannabe" (as seen on the left above my avatar). We're in the process of brainstorming name ideas. This is just a temporary place to put them. If you'd like to suggest one, post it in the comments! We'll pick out the best and let you guys vote on which one you want. I would like to know if it's a possibility that the site may have been hacked. It is possible, but I don't think it happened. If it did I had nothing to do with it. Are you banned from the forums? No, but all of my privileges have been removed. As of right now, Revmen you (Schlaeps), or anybody else on Brickfilms.com doesn't have any control over the site now, correct? The network is completely running it? I think Rev still has administrative powers, but that's all. What happened? It's a long story, but the short of it is. I began work on this site about a week ago. I sent a link to a member via PM and they (apparently) discovered it that way. I did expect to get the boot after they discovered this, but I would have hoped that they would have contacted me beforehand. The fact that they've gone through my personal messages on brickfilms is also concerning. May I ask what will become of this site, and the forums as well? This site will be under construction for a week or two. We'll continue to keep you updated via the blog (and upcoming RSS feed) on what the site will look like, ask your opinions on what you think is needed, what you want / don't want, etc. Why did you start making ilovebrickfilming in the first place? When I first saw Brickfilms beginning to go down the tubes I only saw bad things ahead. I thought that it would be wise, to have a place to go back to for the original ideal that Brickfilms was created under. To just have a place to share, grow, and learn about the hobby. Brickfilms is now a commercial venue. A way to make money. That's not what I signed up for when I started working on Brickfilms. That's not what I signed up for when I registered as a user in 2004. I joined because I like making lego guys walk and I wanted to get better at it and share my creations with other people. That's what this site is about. Will Dave still be Minister of Milkshakes? Abso-freaking-lutely. So, what exactly is this "link" you sent someone? A new redesign plan for the site or something? It was essentially this site minus the blog and had a Brickfilms.com logo on the top.